A couple of weeks ago, we were asked by a user how Forecast 5 will handle the introduction of the forthcoming General Data Protection Regulation in May 2018. The response is that any data produced by Forecast 5 is under the control of the users; users determine where they choose to file and archive all data files generated by Forecast 5. None of the datafiles generated by Forecast 5 go “back to base” for storage; they are rather saved and stored on the user’s servers, or perhaps on remote servers and possibly in the Cloud with services such as OneDrive, GoogleDocs or similar. 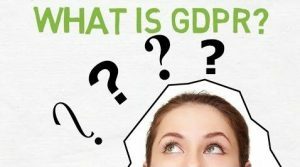 Of course, Cloud storage brings its own questions in relation to GDPR, especially when you consider that one report estimates that the average European enterprise uses over 600 cloud based apps. So, to find your way through this potential minefield, you may find the six suggestions contained in this article beneficial. There are a host of useful videos on YouTube explaining the key principles of GDPR, but I must say I found this Gowlings video both informative and very easy listening! With the integration of Forecast with Xero, Sage50 and a number of other accounting programmes complete, whats next for development? This webinar is a perfect way for you to get an overview of the functionality of Forecast 5, especially if you are low on time, not sure where to start with the trial or want a little bit more information. The Webinar will take an hour. Register today to reserve your space, here. The Essentials course is designed as comprehensive training for all users of Forecast 5. 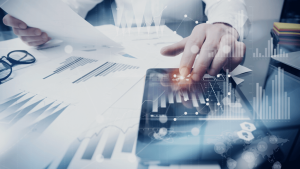 Attendees will gain extensive knowledge into the workings of Forecast 5, such as setting up forecasts, entering actuals and opening balances, viewing reports and changing record types to match their data. You will also learn about What If scenario planning. After completing this course, the attendee will have gained a deeper understanding of Forecast 5.This Training Course will take six hours. To register, please book here. Advanced Training Course – Monday 21 August. The Advanced course is designed as a comprehensive in-depth training for all users of Forecast 5. Attendees will gain extensive knowledge into the advanced workings of Forecast 5, such as stock, wages and consolidations. After completing this course, the attendee will have gained a sound understanding of Forecast 5. This Training Course will take five hours. For storing its data, Forecast 5 ships with SQL’s LocalDB, the entry level edition of Microsoft’s SQL Server software. To improve processing speed, we recommend users upgrade this to SQLExpress. Both the LocalDB and SQLExpress are offered free by Microsoft. As in all engineering projects, however, you need to have the right tools for the job and if your forecast job is vast, with extensive connections to hotlinked files, or if you plan to consolidate scores of subsidiaries you may consider upping the game to enable SQL to speedily offer up the data for Forecast 5 to process. At this point, solid state drives, (SSD) and the full SQL Server may be useful. In Australia last month, Forecast 5 was used to consolidate a group with in excess of 100 subsidiaries, a seemingly monumental task. With the right tools, the consolidation completed in satisfactory time. And in the UK we have had occasion to consider a large forecast with links that numbered in the scores. The speed improvement on loading and copying this forecast between using the full SQL Server with a solid state drive compared to a SQLExpress and a standard hard disc was very impressive. 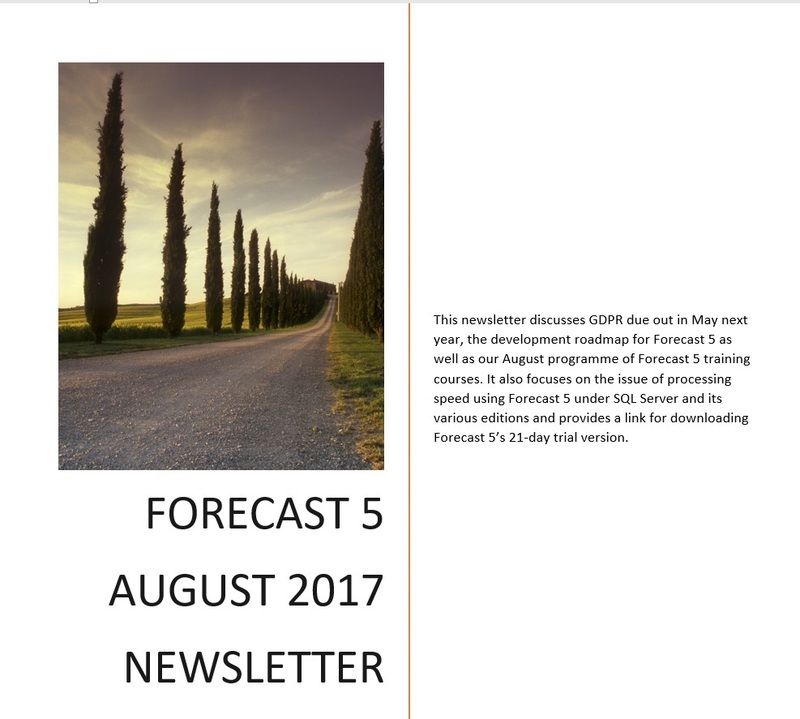 Forecast 5’s processing speed for very large forecasts depends both on underlying hardware and database structure. Chris Riley, our Technical Manager, has written a thoughtful piece on the interplay of these two variables and how to extract the maximum speed out of Forecast 5, which, if you are a “power user” you may find captivating and essential reading. Due out in our next Newsletter. Watch this space! If you would like to take Forecast 5 for a test drive to experience the power of this great forecasting software first hand, please feel free to download your 21-day trial version from this page. Download a Copy of this Newsletter.